Showing results for tags 'fightclass'. 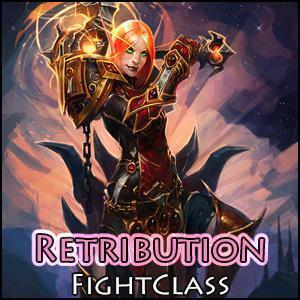 Free C# fight class for Vanilla Aff / Demonology Warlock's. Built towards working with my vanilla levelling profiles The idea behind this was to make a FC's that will go 1-60 where you dont need to populate the action bars with spells after training. This FC is about when you would expect from a levelling lock FC. Works best with instant cast corruption + improved voidwalker torment. Once you have the Voidwalker spell at lvl 10- you NEED a wand. Upon targeting an NPC it will send the pet in. The rotation will keep immolate / Curse of Agony / Coruption on the target. If you have Siphon life it will swap out immolate for that spell. Stack a bot with high stam / spirit and a wand- should be good to go. Should use unending breath when swimming Will attempt to keep a healthstone in your bags + use if in combat at 50% health. Will also use all consumable scrolls! Stamina, spirit and intellect will be cast on you, armour, strength and agility will get send to the pet. If you have any suggestions / bugs / recommendations drop me a PM and i can look into it. This is my paid version of the TBC Hunter Beastmaster Wrobot Rotation It is highly advanced, and has an in-game interface, where you can control almost every aspect of the rotation. For support and suggestions please use: https://wrobot.eu/forums/forum/85-hunter-fightclass-tbc/ Purchase Links https://sellfy.com/p/3UYd/ Features The Paid version comes with some unique features like the in-game interface, /commands and more. The hunter will move back if you are too close to the target to use your bow. This requires that the target does not have aggro on the hunter. The hunter will feed it's pet if needed, and you can set the food in-game. This fightclass will save your settings between sessions, so if you set something example: Turn off Multi-Shot. Then next time you log on it will have saved that setting! Can be used for leveling (Utillizes level abilities) Optimized rotation for max DPS Does not break Polymorph, and doesn't break drinking (Unless your mana is full) Using these abilities can be turned off in the interface Hunter Combat Abilities - Steady Shot <- Your ranged attack speed is automaticly calculated and made so it fits with Steady Shot, so you don't clip your auto attack. it is your AS +0.01 (Even works if you use speed buffs etc.) - Arcane shot <- Will only use if Aspect of the Hawk is active to save mana if in viper. - Multi-shot <- Will only use if 3 or more targets - Aimed Shot <- Has three modes: Pull (This will only use Aimed Shot to pull), Cooldown(This will use aimed shot on cooldown like arcane shot. and last the default: Off (Only set it to Cooldown if you have very high crit) - Hunter's Mark <- Will only cast on targets that is sensible (Hostile targets etc.) - Rapid Fire <- Has 3 modes Cooldown, Elite & Boss - Misdirection <- Can change between pet and focus in the main Status Frame (Will only cast if target has more than 30% hp) - Volley <- Uses Volley if 5 or more mobs around target Pet Combat Abilities <- None of them will attack if target is shielded - Bestial Wrath <- Will only use if you have pet, Has 3 modes Cooldown, Elite & Boss - Kill Command <- Will only use if you have pet Hunter Misc Abilities - Aspect of the Hawk <- Smart aspects | Uses this if you have enough mana and you are in-combat - Aspect of the Viper <- Smart aspects | Uses this if you need mana and you are in-combat - Feign Death <- Smart | Will only use this if pet is close to target and it will also wait some time for your pet to get aggro. - Volley Mob Amount <- Set the amount of mobs that needs to be in a group, to use Volley. Pet Misc Abilities - Pet Auto Attack <- Pet will auto attack your target (will not spam) - Call pet - Revive Pet - Mend pet - Feed pet <- Very smart | Will feed pet whatever food you have specified in the Pet Food area. It will only feed pet if pet needs it. Pet will not attack while being fed - Pet Food <- Define what food your pet eats (Default: Clefthoof Ribs) Racial Abilities - Blood Fury <- Will only be able to use if you are an Orc, Has 3 modes Cooldown, Elite & Boss - Berserking <- Will only be able to use if you are a Troll, Has 3 modes Cooldown, Elite & Boss - Arcane Torrent <- Will only be able to use if you are a Blood Elf. Will only use if you are below 25% mana or have many enemies around you. Item Abilities - Trinket 1 - <- Will use your first trinket if it has a use ability, Has 3 modes Cooldown, Elite & Boss - Trinket 2 - <- Will use your second trinket if it has a use ability, Has 3 modes Cooldown, Elite & Boss Leveling Abilities - Serpent Sting <- Will be off by default unless you are below level 62 - Ratpor Strike <- Will be off by default unless you are below level 62 - Mongoose Bite <- Will be off by default unless you are below level 62 - Freezing Trap <- Will be off by default unless you are below level 62. It will use freezing trap if there are more than 1 mob in front of you (good if you don't have pet, or you pull too many mobs while questing) - Aspect of the Cheetah <- Will be used between fights, to get there faster. Commands /statusframe <- shows/Hides the in-game interface /rotatoggle <- Toggles rota pause on/off. These commands can be bound in-game by making a macro and adding to an action bar. Coming Soon - Please add suggestions on my Discord. Versions: FAQ: In-game Interface Always feel free to send me suggestions or bug reports via PM on WRobot Forum or through my Discord channel! Hi! Im trying to grind level my rogue as safe as possible because its movement so stuttering, im probably getting a report from every other players. So i came up with the idea to make a fightclass thats always casts stealth out of combat, and stays stealthed between every mobs / npc. My problem is the bot casts stealth right after out of combat, and then loots wich is brakes the stealth. Is there any way to make a delay before casting the spell so it will loot / skin first and then casts stealth or any option to make a loot/skin -> stealth order? Thanks for the help! This is my paid version of the Vanilla Warrior Protection Wrobot Rotation It is highly advanced, and has an in-game interface, where you can control almost every aspect of the rotation. For support and suggestions please use: https://wrobot.eu/forums/forum/92-warrior-fightclass-vanilla/ Purchase Links https://sellfy.com/p/3fdR/ Talents http://armory.twinstar.cz/talent-calc.php?cid=1&d=vanilla&tal=0500200000000000000500000000000000055250113530021051 Features The Paid version comes with some unique features like the in-game interface, /commands and more. The Warrior will make sure that there are sunders on all ads. (Making thread on them) The Warrior will taunt adds that are not targeting the warrior. (He will stance dance and use mocking blow, if taunt is on CD) This fightclass will save your settings between sessions, so if you set something example: Turn off taunt. Then next time you log on it will have saved that setting! Can be used for leveling (however it's not currently focused on using level abilities for solo play) You can even turn stuff on that is not yet learned. 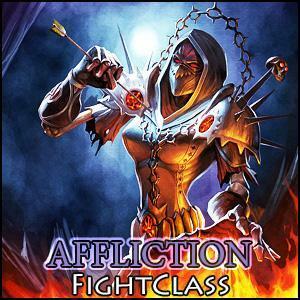 The fightclass will begin using the abilities when they are learned if they are turned on. Optimized rotation for max Threat Does not break Polymorph. Using these abilities can be turned off in the interface Threat Abilities - Taunt <- Taunts adds off party members. - Heroic Strike <- Will be used if you have too much rage. (And only 1 mob is at you) - Cleave <- Will be used if you have enough rage, and there are more mobs at you. - Shield Slam <- Will be used to generate a high amount of threat. - Revenge <- Will be used on cooldown, when you block, dodge or parry. - Sunder Armor <- Will keep stack up on mobs at all time (If Main tank is enabled, it will make sure there is 1 sunder on all adds) Racial Abilities - Blood Fury <- Will only be able to use if you are an Orc, Has 4 modes Cooldown, Cooldown 2+, Elite & Boss - Berserking <- Will only be able to use if you are a Troll, Has 4 modes Cooldown, Cooldown 2+, Elite & Boss Item Abilities - Trinket 1 - <- Will use your first trinket if it has a use ability, Has 4 modes Cooldown, Cooldown 2+, Elite & Boss - Trinket 2 - <- Will use your second trinket if it has a use ability, Has 4 modes Cooldown, Cooldown 2+, Elite & Boss Mitigation Abilities - Shield Block <- Will be used if enough rage, and the target is a boss (It's a waste to use it on packs). - Last Stand <- Will be used if target is a boss or there are 2 or more mobs targeting you. AND your hp is low. - Shield Wall <- Will be used if target is a boss or there are 2 or more mobs targeting you, AND your hp is semi low. - Demoralizing Shout <- Will be used if target is a boss or there are 2 or more mobs targeting you and you have enough rage. Utility Abilities - Mocking Blow <- Will stance dance to use this if your taunt is on cooldown. - Bloodrage <- Will use this to gain enough rage to use Battle Shout (Creates threat on just pulled packs) - Berserker Rage <- Berserker Rage is not currently utilized very well. - Battle Shout <- Will use this after pulling, to add threat on all adds. Extra Abilities - Combat Range <- Sets the combat range, (how close does the tank go to the target). - Pull Latency <- Wait time for it to use bow/xbow/gun to pull in MS. (If your tank interrupts shooting, then increase this number). Advanced Settings Fightclass Settings - Settings will be added here later. Commands /wr or /wrobot <- Shows available commands (You can use /wr or /wrobot for all commands) /wrobot FC version <- Shows the version of the Fightclass /wrobot FC status <- Shows or hides the Rotation Status window /wrobot FC pause <- Pauses/Unpauses the bot These commands can be bound in-game by making a macro and adding to an action bar. Coming Soon - More advanced settings - Redesign of switches - Battle Shout option to use only for rage, or to use when you don't have the buff. Versions: FAQ: In-game Interface Always feel free to send me suggestions or bug reports via PM on WRobot Forum! Hello, Is it possible, with the fightclass creator, to force using spell rank 1 instead of the best rank available? I would like to use the rank 1 instead of rank 3 😊 Thank you! This is my paid version of the Vanilla Hunter Marksmanship Wrobot Rotation It is highly advanced, and has an in-game interface, where you can control almost every aspect of the rotation. For support and suggestions please use: https://wrobot.eu/forums/forum/84-hunter-fightclass-vanilla/ Purchase Links https://sellfy.com/p/wyVU/ Talents http://armory.twinstar.cz/talent-calc.php?cid=3&d=vanilla&tal=5000000000000000520510305130513300242010000000 Features The Paid version comes with some unique features like the in-game interface, /commands and more. The hunter will move back if you are too close to the target to use your bow. This requires that the target does not have aggro on the hunter. The hunter will feed it's pet if needed, and you can set the food in-game. This fightclass will save your settings between sessions, so if you set something example: Turn off Multi-Shot. Then next time you log on it will have saved that setting! Can be used for leveling (Utillizes level abilities) You can even turn stuff on that is not yet learned. The fightclass will begin using the abilities when they are learned if they are turned on. Optimized rotation for max DPS Does not break Polymorph, and doesn't break drinking (Unless your mana is full) Using these abilities can be turned off in the interface Hunter Combat Abilities - Aimed Shot <- Main ability - Multi-shot <- Second Main ability - Hunter's Mark <- Will only cast on targets that is sensible (Hostile targets etc.) - Rapid Fire <- Has 4 modes Cooldown, Cooldown 2+, Elite & Boss - Volley <- Uses Volley if 5 or more mobs around target - Volley Mob Amount <- Set the amount of mobs that needs to be in a group, to use Volley. Racial Abilities - Blood Fury <- Will only be able to use if you are an Orc, Has 4 modes Cooldown, Cooldown 2+, Elite & Boss - Berserking <- Will only be able to use if you are a Troll, Has 4 modes Cooldown, Cooldown 2+, Elite & Boss Item Abilities - Trinket 1 - <- Will use your first trinket if it has a use ability, Has 4 modes Cooldown, Cooldown 2+, Elite & Boss - Trinket 2 - <- Will use your second trinket if it has a use ability, Has 4 modes Cooldown, Cooldown 2+, Elite & Boss Hunter Misc Abilities - Aspect of the Hawk <- Will keep on unless Cheetah is on, then it will only be on in combat - Trueshot Aura <- Always on - Feign Death <- Smart | Will only use this if pet is close to target and it will also wait some time for your pet to get aggro. - Disengage <- Will use disengage if you have an active pet, and a mob is targeting you in melee range. Pet Misc Abilities - Pet Auto Attack <- Pet will auto attack your target (will not spam) - Call pet - Revive Pet - Mend pet - Feed pet <- Very smart | Will feed pet whatever food you have specified in the Pet Settings area. It will only feed pet if pet needs it. Pet will not attack while being fed Leveling Abilities - Concussive Shot <- Will be off by default unless you are below level 20 - Serpent Sting <- Will be off by default unless you are below level 20 - Arcane shot <- Is off by default unless you are below level 20 - Raptor Strike <- Will be off by default unless you are below level 20 - Mongoose Bite <- Will be off by default unless you are below level 20 - Aspect of the Cheetah <- Will be used between fights, to get there faster. - Aspect of the Monkey <- Will only work if Aspect of the Hawk is Disabled Misc Abilities Wing Clip <- Turned off by default, as it's mainly used in pvp. Viper Sting <- Turned off by default, as it's mainly used in pvp. Backtracking <- Turn on/off backtracking from mobs. Combat Range <- Adjust the range which the hunter will begin attacking mobs. (Default 25). 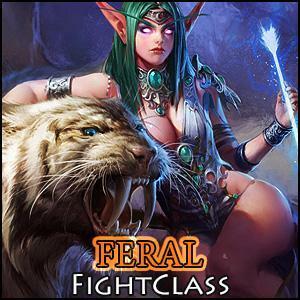 Advanced Settings Fightclass Settings - Feign Death Delay (Seconds): The number of seconds after a fight has been started, till the bot is allowed to use Feign Death (The higher the number, the more time the pet has to get aggro). 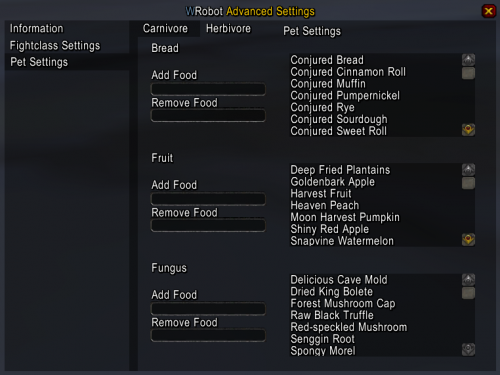 Pet Settings - You can add/remove foods from the lists here: It should be noted that if you log out or reloadUI the food lists will reset. (This will be fixed in next update) Commands /wr or /wrobot <- Shows available commands (You can use /wr or /wrobot for all commands) /wrobot FC version <- Shows the version of the Fightclass /wrobot FC status <- Shows or hides the Rotation Status window /wrobot FC pause <- Pauses/Unpauses the bot /wrobot FC pettank <- Enables/Disables pet tank These commands can be bound in-game by making a macro and adding to an action bar. Coming Soon - More advanced settings - Redesign of switches - Saving of player added foods between sessions (Right now it does not save the food you add manually if you logout or reloadui.) Versions: FAQ: In-game Interface Always feel free to send me suggestions or bug reports via PM on WRobot Forum or through my Discord channel! Hello, i download serveral c# fightprofiles but i don't find a method to use a spell with rank. I want to spell healing touch rank 2 when my healthpercent > 50 < 65 and rank 3 wenn my healthpercent < 50 Can you pls help me?